please join me for a few moments of singing happily along…. ??? Is there anyone who sang along who isn’t smiling right now???? Note: I’m being a bit playful and whimsical in this post. Of course, those baby birds are chirping because they’re hungry and letting their parents know they want food..now! And the chirping parents are in the midst of a very busy, probably tiring season…nurturing their babies by providing dozens of meals each day and protecting those babies from predators. 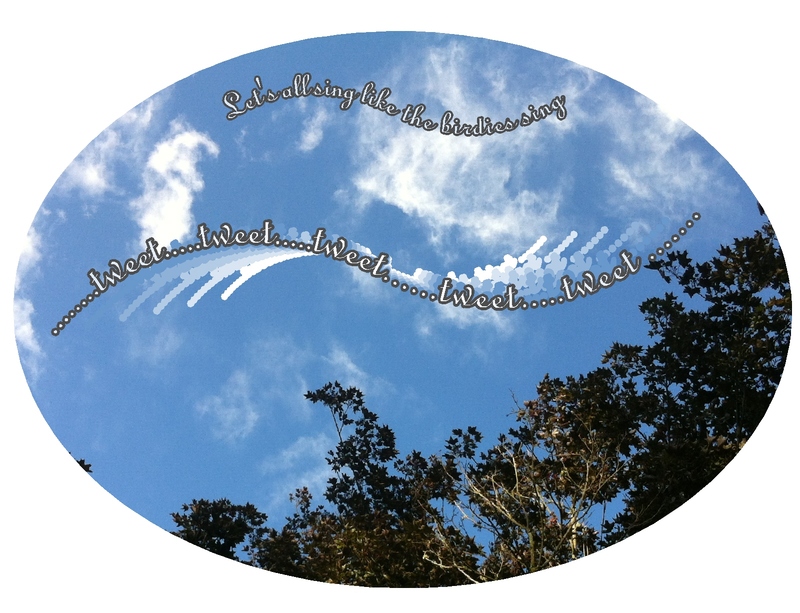 But….in this post, I’m letting those thoughts go, using oodles of “poetic license” and thinking more playfully…in order to nurture being lighter and brighter! This entry was posted in Happiness and tagged Animals, Appreciation, Beauty, Flourish, Happiness, Inspiration, Joy, Life, Love, Loving kindness, Spirituality. Bookmark the permalink. How wonderful! Aren’t birds a delight to watch? I can see the mother and father chickadee, right from where I sit here at the computer…busy as can be, back and forth, again and again….feeding the babies inside that house. I get to sing, while they are “working away”…. busy parenting those babies …busy as can be! Pingback: Nurturing Thursday – Treasure | "On Dragonfly Wings with Buttercup Tea"
My little daughter appreciated the Disney video! Weren’t those videos fun! My daughter, now 26, was amused last night when I sent her some drafts of these pages and a link to the videos. Laurie, Happy Thursday to you, too! Oh Robin, that’s good news! 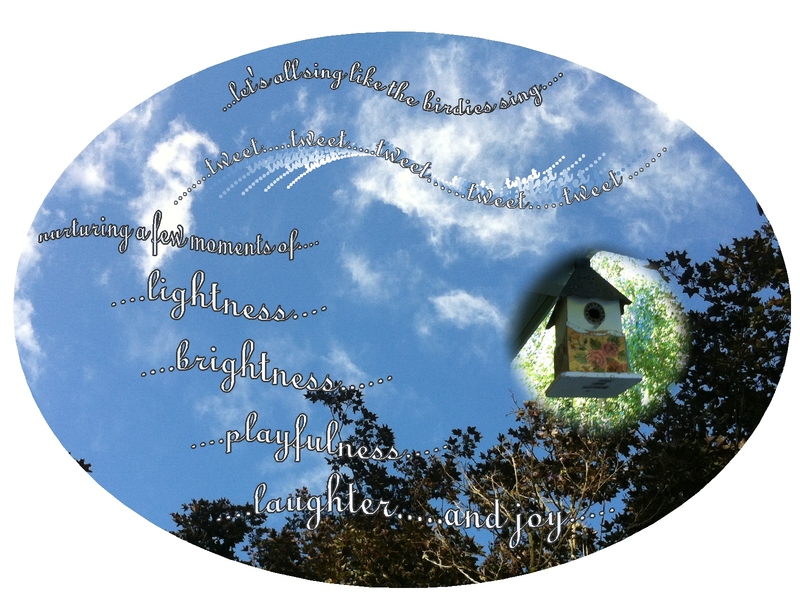 😀 I thought of you as I posted and hoped that you’re keeping a balance of playfulness in your busy days at the ranch…keep warbling away? 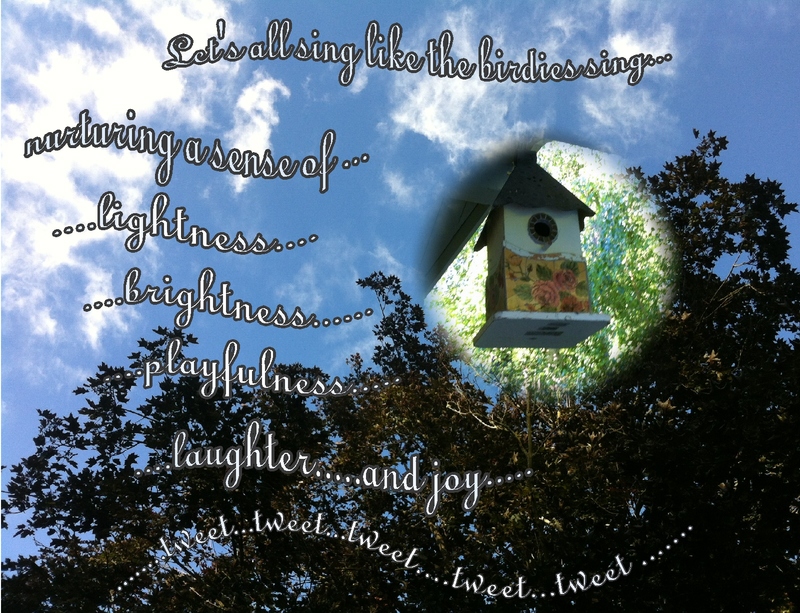 Life should be filled with lightness, brightness, laughter, and playfulness. 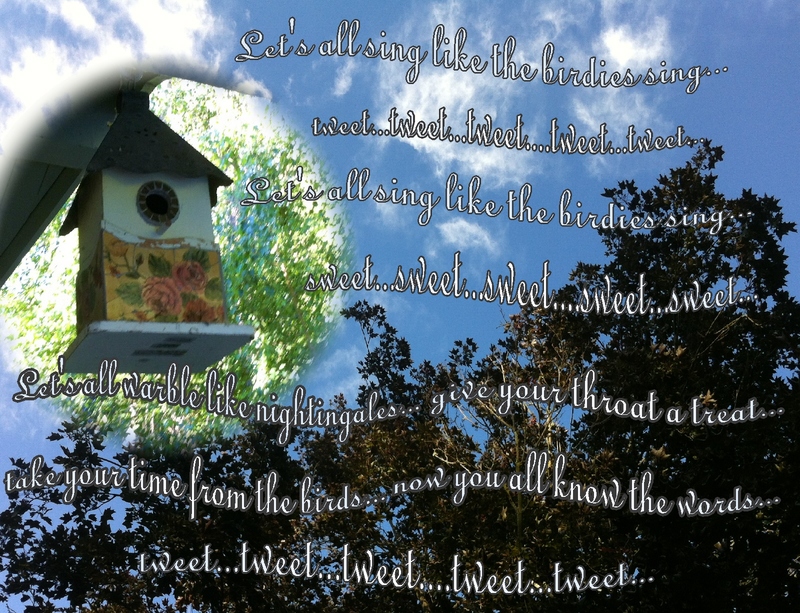 And the serenade of songbirds. so tweet! The other day I sat and watched, for probably a good five minutes, while a chickadee meticulously collected bits of cat fur from our front door mat. I smiled and thought about the well insulated nest she was building! What persistence that chickadee has… perhaps relieved to find so much nesting material in one spot….hmmmm…. what might be considered the enemy to a bird provided the materials for the nest. What a soft nest it must be! What could be better than chickadees and woo woo stuff together??? I love that sing-chronicity! 😀 And ohhhh….wonderful….you sang along too! 😀 …I’m smiling! There’s a “Tiki Room” at Disneyland, and all the animetronic birds and flowers sing that song, and it’s one of my favorites! It always makes me happy to hear it. Thank you! 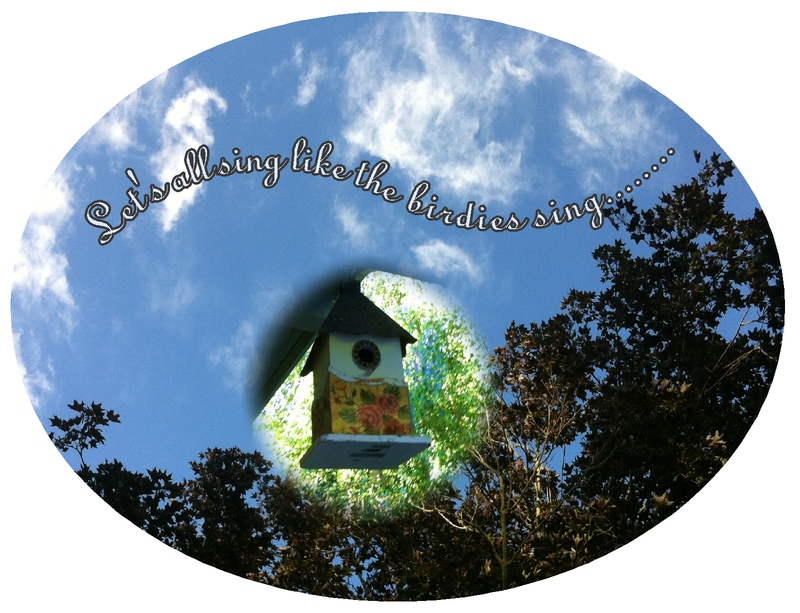 Ohhhh….the birdsong meditation is a delight… thank you for linking it. 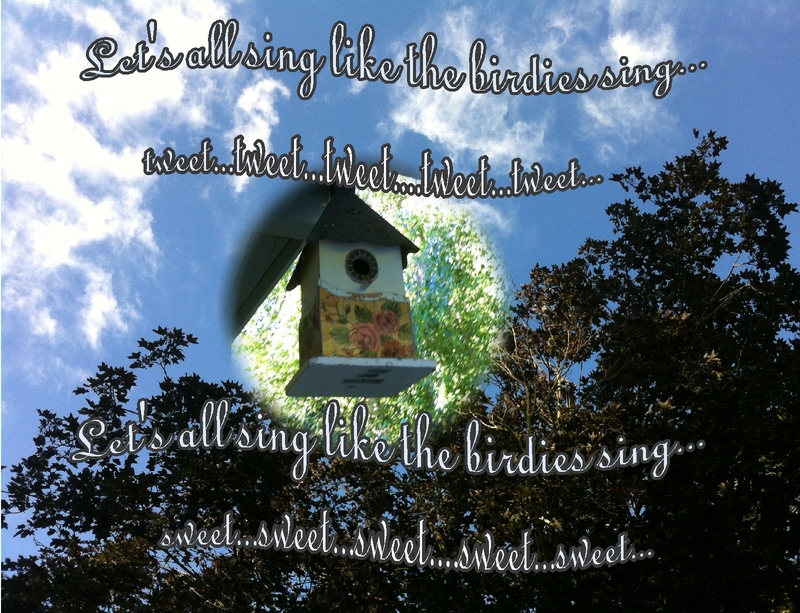 I was outside this evening listening to the birds in our backyard….also a delight. What quiet, wisdom and compassion are accessible in nature. My kids used to have the Disney version on a VHS of sing a longs…oh, the memories. I’d never heard the 1934 original version…thanks for including it. Aren’t those sing a long memories lovely? I was surprised to find the 1934 version…and happy to find out how in the world my father knew that song! A nice surprise….happy you enjoyed it, too. Pingback: Nurturing Thursday – Only YOU | "On Dragonfly Wings with Buttercup Tea"